The sound of crampons crunching into the ice. A weary hand swinging an ice axe into the snow wall. The straining breath when you struggle to raise your exhausted body another half meter up the mountain. Only 100 meters... 50 meters... between you and the peak of K2, one of the most difficult eight-thousanders. Standing in the blazing sun, you look down to where your tent awaits you. But to reach it, you must go through the blizzard raging on the toughest stretch. Can you do it? 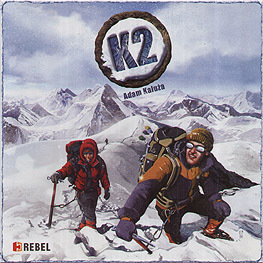 In the game K2, each player directs a team of two mountaineers who are competing with other teams, trying to reach the peak and survive until the end of the 18-day expedition. Players move mountaineers on the board by playing cards each round. The higher a climber reaches, the more victory points gained at the end of the game. However, in the upper parts of the mountain one must be careful about the level of acclimatization. If it falls below 1, the exhausted mountaineer dies, and the player gains no points from this climber. Therefore it's important to choose an appropriate route to the summit, to place tents optimally, and to pay attention to the weather, which significantly affects the difficulty of climbing to the summit.